Excess mortality for selected US cities in 2012. The midpoint of the year 2012 has arrived. I looked at mortality statistics for this year from the the Morbidity and Mortality Weekly Report (MMWR), which is published by the CDC (Centers for Disease Control and Prevention). The previous report I made, for 2011, can be found here. I have only looked at certain cities so far. Making a full report will take quite a bit of time and effort, and I am in short supply of time and energy lately. Writing the programs for the 2011 report took me 3 weeks, and that didn’t include downloading the data, running the programs, and compiling results every week. The table below can be enlarged on clicking. There is a pdf version of this table available here. Most of the cities which had elevated mortality in 2011 also have higher numbers of deaths in 2012. Some cities, such as Las Vegas, Detroit, and Charlotte, have higher mortality rates so far this year than they did in 2011. 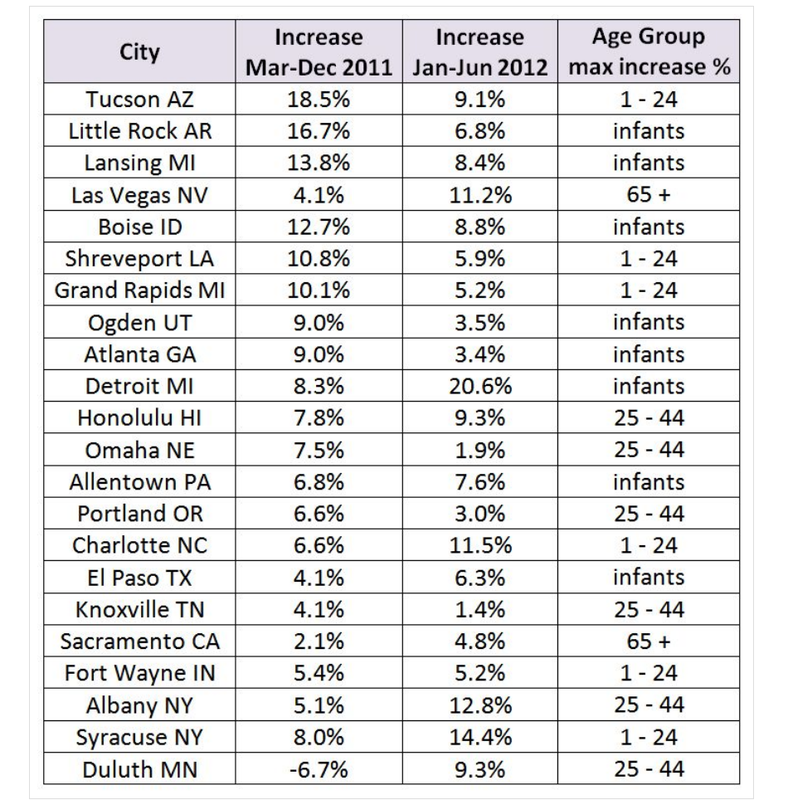 I have also included, in the last column, the age group in which mortality increased the most for each city. 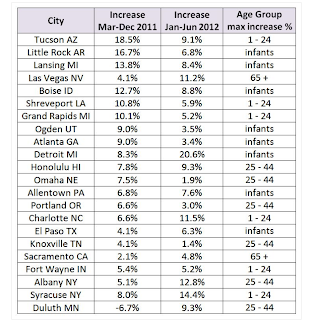 Infant mortality was highest out of all age groups in 8 out of the 22 cities. Babies are dying.